President Trump's chief economic adviser Gary Cohn says the administration must "do better" in tackling and condemning neo-Nazis and other hate groups in the wake of the violent clashes in Charlottesville, Virginia, according to an interview with the Financial Times. Cohn's candid critique of the White House comes after what he called "enormous pressure" to step down from his West Wing post, in light of Mr. Trump's divisive claims that the blame for the violence lay on "both sides," equating the efforts by white supremacists to counter protesters. "As a patriotic American, I am reluctant to leave my post , because I feel a duty to fulfill my commitment to work on behalf of the American people. But I also feel compelled to voice my distress over the events of the last two weeks," Cohn said. He added, "As a Jewish American, I will not allow neo-Nazis ranting 'Jews will not replace us' to cause this Jew to leave his job. I feel deep empathy for all who have been targeted by these hate groups. We must all unite together against them." While Cohn admits that he considered leaving the post -- what would be yet another West Wing staffer to leave within the first 7 months of the Trump administration -- he told the Financial Times he was honest with the president in his decision to stay on. "I have to do what is best for me and my family. I have had numerous private conversations with the president on this topic [and] I have not been bashful saying what I think," said Cohn. "This is a personal issue for each of us. We are all grappling with it. This takes time to grapple with," he added. White House Press Secretary Sarah Huckabee Sanders said on Thursday that while she wouldn't go into detail surrounding the "exact deliberations" between Cohn and the president, she echoed the economic adviser's calls to do more. Sanders told reporters that as long as racism and bigotry exist, "there's always things we can do" to combat their impacts. "We should look for ways we can do more until there's zero of those things," she added. 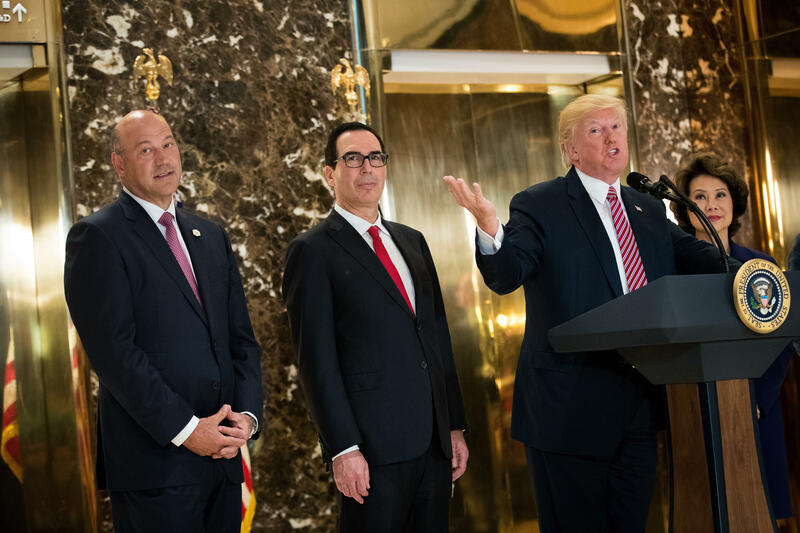 Now Cohn is looking ahead, joining Treasury Secretary Steve Mnuchin in helping to formulate and drive the administration's agenda toward economic and tax reform this fall. At Thursday's White House briefing, Press Secretary Sarah Huckabee Sanders hinted that a White House push on tax reform would likely begin next week.